I’ve been on the hunt for a vanilla protein powder to mix with fruit for a quick breakfast smoothie but have come up short time and time again. Either the powder I buy isn’t palatable or it’s just not something I’d ever buy again. Half of the brands I’ve tried have wound up in the trash over the years and the other half I reluctantly finished. I gave up on finding something I liked until recently when I saw Zaggora’s line of Breakfast Smoothies in my Facebook feed. I wanted to get more info, so I turned to Google to see what people thought about this new line. Aside from 1 review which said it was good, I couldn’t find much on the Zaggora Breakfast Smoothie – Vanilla flavor, so on a whim, I bought it. Read on for my Zaggora Breakfast Smoothie review! My absolute favorite protein powder is Fit 365’s Vanilla Shake. It tastes good on its own but is absolutely delicious with a banana, peanut butter, nut milk and ice. Or any mix of fruit. But it’s not the cheapest around and there’s no international delivery, so the cost to reship it to myself makes Fit 365 out of the question except for the 2 bags I bring back with me when I visit the USA. Unfortunately, my luck trying vanilla protein powders in France hasn’t been great. Shakes are subjective and one that I find delicious might make you gag and vice versa. I bought a 40-some euro tub of Vega after reading mostly positive reviews and the sweet taste turned me off. Combine that with the grossness and I couldn’t even choke it down. Money down the drain. I go through food phases that last a couple of weeks where I’ll want something daily and then get sick of it. Since it’s summer now, I’m in smoothie mode and a refreshing, nutritious drink for breakfast is perfect, especially if I don’t have time to make anything more elaborate. I knew of Zaggora’s line of workout apparel but didn’t realize they had expanded into the smoothie market and had a European site in addition to the American one. I was getting hit with their ads daily on Facebook, so I gave in. 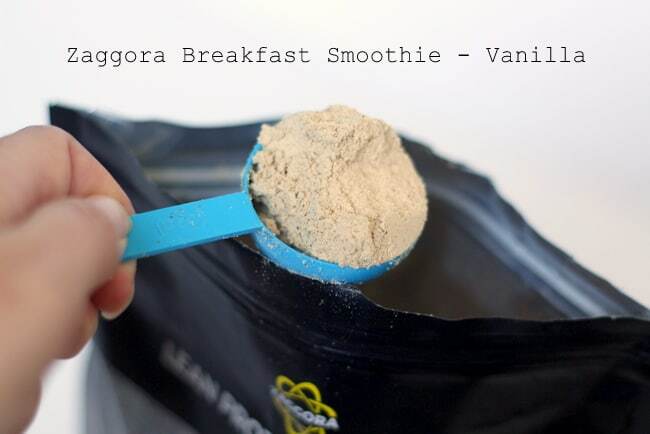 What’s in Zaggora Breakfast Smoothie – Vanilla? The smoothie is also only 75 calories per serving, vegan, and gluten free. 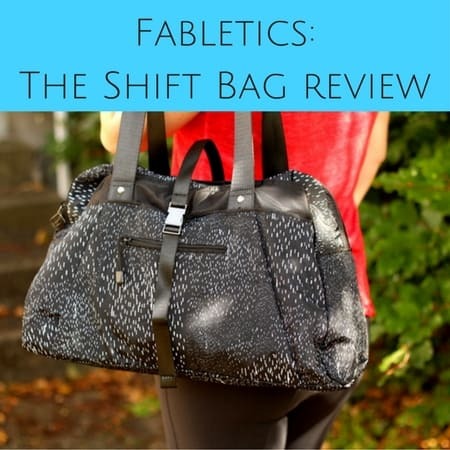 It was designed for women by women. On the nutritional front, it’s high in fiber, has pre and probiotics for a healthy gut as well as digestive enzymes to aid the absorption of nutrients, and is high in vitamins. Sounded good to me. I was sold. 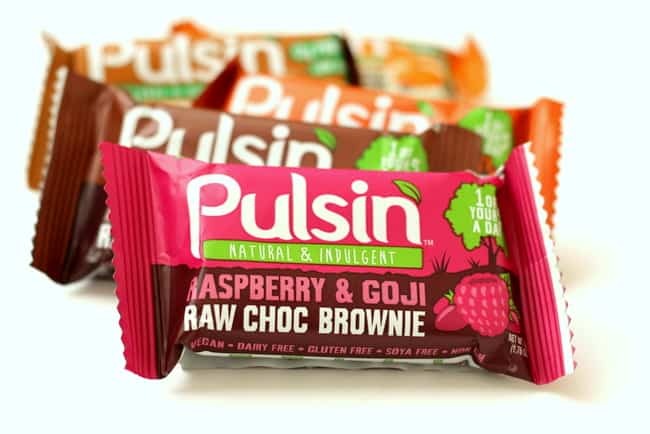 Cost: 3/5 : 29 € for a 400g Pack (contains 20 Servings of 20 grams each). It’s not the most expensive powder out there but not the cheapest either. Packaging: 4/5: Attractive logo and bag with an easy zip-top seal and clear nutritional info on back. Texture: 5/5 : Great. The fine powder mixes well with liquid, fruit, and ice and isn’t gritty or overly thick. Taste: 2/5 alone with just liquid and ice & 4/5 when mixed with raspberries (see below for more on that) : I wasn’t impressed with the taste until I found a mix of fruit that worked for me. Mixed alone with just water or milk and ice, the Zaggora Vanilla is barely palatable. I could drink it but I had to force myself. The taste was far from ideal and I immediately regretting buying it. 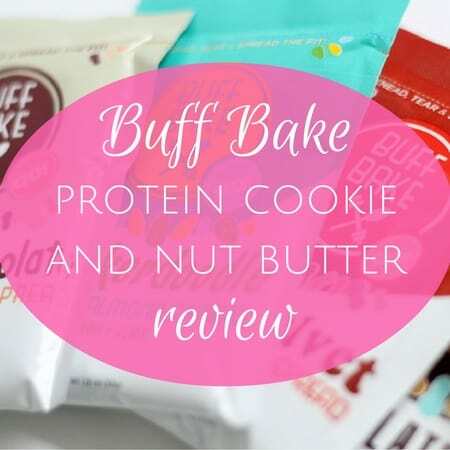 I tried it with a banana and nut butter and it was slightly better but I still wasn’t in love. At his stage, it was just OK.
After a few days of trial and error, I found the fruit combo that worked best for my palate — banana and frozen raspberries. The sweetness of the raspberries masked the taste that I found off-putting. When mixed with berries, the smoothie was not only palatable but actually quite tasty! I could no longer taste the vanilla taste that I hated. It’s actually really good this way. Keep in mind, you might love it plain or with just a banana. For me, berries are a must! Bottom line on taste: Alone, the smoothie is bordering on terrible. 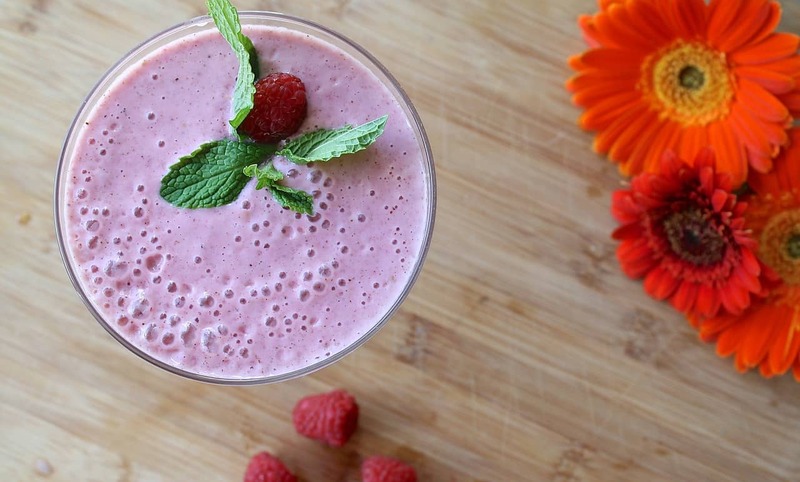 With fruit, it’s just OK. And with raspberries, it’s great and something I feel good about drinking! 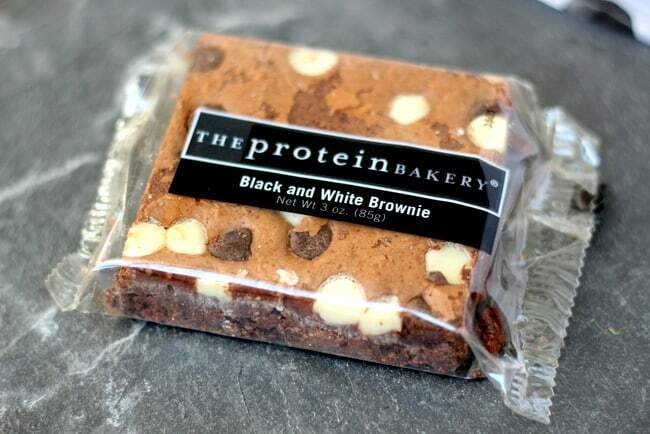 You tend to like a variety of protein powders and aren’t too picky when it comes to taste. You’re looking for a nutrient-dense vegan shake that’s low in calories in sugar. You’re really picky about protein shakes and plan on mixing this only with liquid and no fruit. So now that I’ve found a fruit mix that works for me, I’ll be finishing my bag. Will I buy the Zaggora Breakfast Smoothie line again? Jury is still out. I’d ideally like a vanilla protein powder that mixes well with all kinds of fruit and even tastes good alone. I see Zaggora makes a couple of other flavors but I’d be hesitant to shell out 29 € per bag on something I’m not sure I’ll like. Do you have a favorite vanilla protein powder? 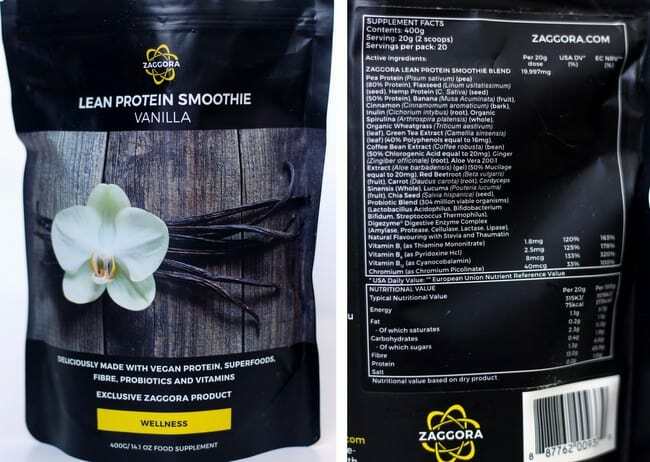 Disclosure: I bought my protein powder with my own money and was not compensated for this Zaggora Breakfast Smoothie review. 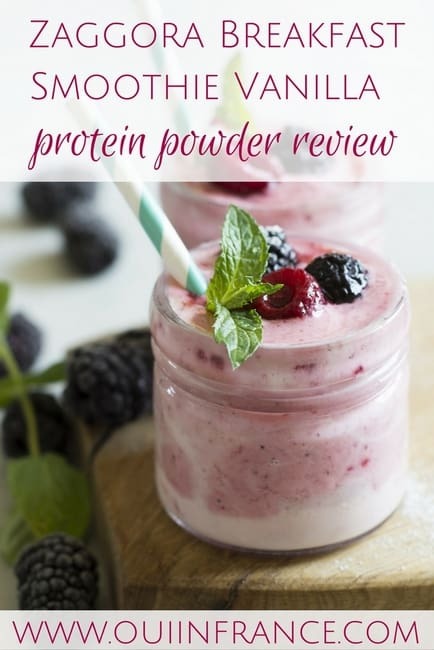 I’ve tried tons of protein powders – different flavors and brands. The only flavor I like is chocolate. I’m a fan of Vegas’s Proteins and Greens brand. I can’t get into vanilla (don’t try mocha or coconut – those are even sweeter than vanilla). Yup, I think the Vega Protein & Greens Vanilla was the one that I couldn’t even stomach and it was SO expensive here. Just nasty, and I don’t say that lightly. I’d really be hesitant to buy anything Vega ever again. What’s your second fave? I’ve just bought two bags, one vanilla and one coconut and chocolate. I was so excited as the packaging makes it look so yummy but OMG it’s disgusting! I am so gutted, 50 dollars is not money I have to waste on something so vile. So I will be trying your recipe but with stawberries as raspberries are super expensive where I live. So thanks for the inspiration to keep going with this. Fingers crossed it tastes better with berries otherwise I just wasted a crazy sum of money as it is totally undrinkable on its own. Hi Emma! Sorry to hear you hate the Zaggora shakes too. Their marketing is slick and I’m sure we’re not the only 2 who are disappointed. 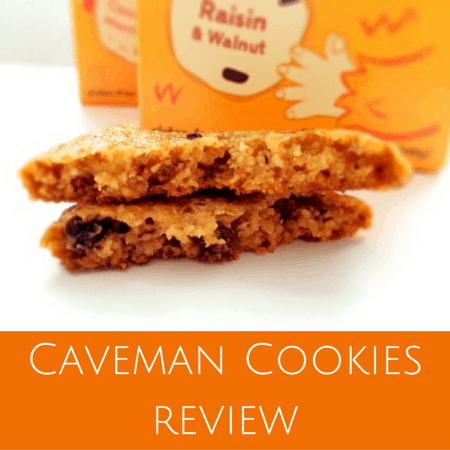 Nutritionally, the shakes seem sound, but the taste? Yuck. Is the coco/choco one just as bad? I was thinking of trying it but will wait on your reply. If you hate the vanilla, I trust your judgment. I’m sure some people like it plain with just the vanilla powder, but I just can’t make myself drink it that way. I am currently finishing my bag of vanilla with strawberries and bananas, but I have to say the sweetness of the raspberries really helps mask the powder’s flavor. It’s drinkable with strawberries but I like it better with raspberries. Try and let me know what you think. Good luck! I don’t like vanilla protein smoothies that much but really cafe latte & chocolate (I can drink vanilla if mixed with coffee). I currently am drinking Beach Body shakeology which I get shipped to me by a friend – so very very very expensive. the 29€ sounds cheap as chips to me compared. Do you think the vanilla could work with coffee ? Have you tried their morning slender energy one ?